Richard Jones has worked for more than twenty years in the creative arts. He is the illustrator of numerous picture books, including Bird Builds a Nest and The Squirrels’ Busy Year, both written by Martin Jenkins. Richard Jones lives in Devon, England. The engaging artwork nudges the poems into the foreground, giving them ample room to breathe. The collection closes with "How to Pay Attention," just two lines that are almost a sacred offering. "Close this book. / Look." Young people lucky enough to find this miraculous collection in their hands will indeed look. Who can resist a good how-to? Janeczko, an astute editor of children’s poetry, capitalizes on his readers’ natural curiosity and yearning for autonomy while opening up the possibilities for what a how-to—both the question and the answer—can be...The entire book becomes a how-to , instructing readers not only in various activities but also in all the ways poetry can resonate. In this charmingly illustrated collection, poets classic (Christina Rossetti, Robert Louis Stevenson) and modern (Kwame Alexander, Margarita Engle) offer a variety of how-to poems, providing young readers with instructions both jocular and sincere...Jones' illustrations are truly scene-stealing: at times impish and adorable, at others restrained and lovely, they capture the essence of each poem. A useful poetry compendium that can be shared in sections or in its entirety. Esteemed poet and anthologist Janeczko here assembles over thirty compact poems that explore, with varying degrees of seriousness, how something should be done...Kids who find poetry too abstract will appreciate the more actionable approach, and those just dipping in are sure to find unexpected pleasures. Jones’s digitally edited paintings capture the tone and feeling of each piece while still being unified overall with color choices, soft edges, and keen observations of nature. Though some of the selections are silly, the accompanying pictures are lush, gentle, and tender, filling each large page. 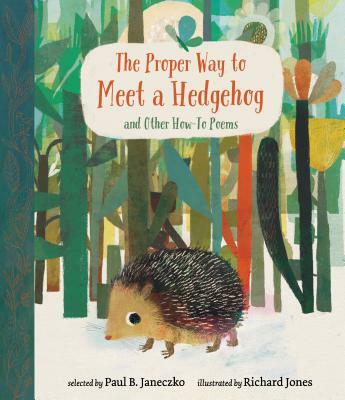 A varied and approachable poetry collection that children can enjoy on their own, and that adults can enjoy sharing with them.